Sea anemones are cnidarians belonging to the order Actiniaria, which is further divided into suborders, infraorders, families, genera and species. The approximately 1,000 sea anemone species identified are classified into four suborders: Endocoelantheae, Nyantheae, Protantheae and Ptychodacteae. Anemones are divided based on differences in physiology. Sea anemones are grouped into the suborder Endocoelantheae because they have well-developed pedal discs but have no basilar muscles, which are muscles that connect the disc to the body walls. Their body columns are smooth. Suborder Endocoelantheae is divided into two families, Actinernidae and Halcuriidae. Anemones in the family Halcuriidae have elongated bodies with no lobes. They have fewer tentacles than most anemones, having only up to 70. This family is split into the genera Halcurias and Carlgrenia. Actinernidae anemones have thick bodies divided into four to eight lobes. Actinernidae includes the genera Synhalcurias, Isactinernus, Synactinernus and Actinernus. Nyantheae contains the most anemone infraorders and families of any suborder by far. It contains the infraorders Athenaria, Boloceroidaria and Thenaria. Boloceroidaria contains two families, Boloceroididae and Nevadneidae. Athenaria contains 11 families and Thenaria is divided into 19 families. More anemones belong to the suborder Nyantheae than any other. Examples from the suborder Nyantheae include the burrowing anemone (Halcampa duodecimcirrata), the frilled anemone (Metridium senile), the swimming anemone (Stomphia coccinea) and the brightly-colored blister anemone (Phymactis papillosa). Many species in the suborder Protantheae are commonly found in cold northern Atlantic waters. All anemones classified in the suborder Protantheae belong to the family Gonactiniidae. These anemones aren't capable of involution, or pulling their tentacles into their body tubes for protection. Their tentacles also can't retract. Protantheae is one of the anemone types that can reproduce asexually. Protanthea simplex is an example of a species classified in this suborder. Called sealoch anemones, they are very small, usually less than two inches tall, and populate coastal waters around Great Britain at depths of about 1,500 feet. Gonactinia prolifera is another species in this family. Both animals feed on particles floating in the ocean water. The suborder Ptychodacteae includes the Antarctic anemones. 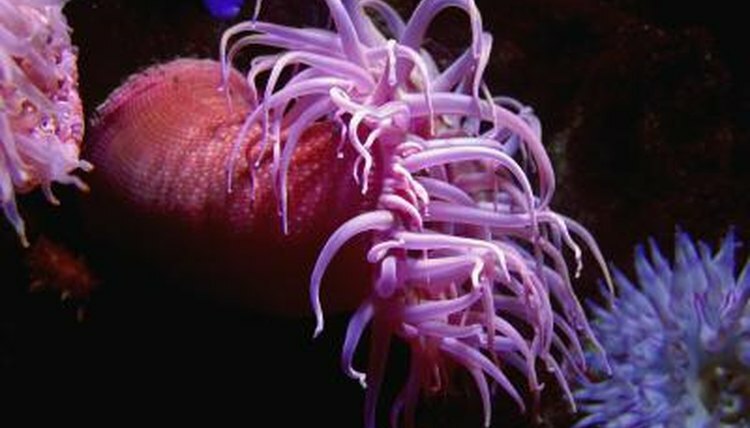 These animals grow slowly but can reach rather large sizes for anemones, for instance Urticina antarctica grows to about six inches tall and wide. Ptychodacteae is subdivided into the families Preactiidae and Ptychodactiidae. Preactiidae is divided into two genera that contain one species each. Ptychodactiidae contains only one genus, Ptychodactis, which contains two species -- Ptychodactis patula and the recently-discovered Ptychodactis aleutiensis.